Even when a defendant is well defended, properly tried and justly found guilty, experience shows that capital punishment simply doesn’t work as a deterrent. Nor does it heal or redress any wounds, because only forgiveness can do that. It does succeed though in answering violence with violence — a violence wrapped in the piety of state approval, which implicates all of us as citizens in the taking of more lives. Turning away from capital punishment does not diminish our support for the families of murder victims. They bear a terrible burden of grief, and they rightly demand justice. Real murderers deserve punishment; but even properly tried and justly convicted murderers — men and women who are found guilty of heinous crimes — retain their God-given dignity as human beings. When we take a murderer’s life we only add to the violence in an already violent culture, and we demean our own dignity in the process. Both Scripture and Catholic tradition support the legitimacy of the death penalty under certain limited conditions. But the Church has repeatedly called us to a higher road over the past five decades. We don’t need to kill people to protect society or punish the guilty. And we should never be eager to take anyone’s life. As a result, except in the most extreme circumstances, capital punishment cannot be justified. In developed countries like our own, it should have no place in our public life. Last month here in Pennsylvania, execution warrants were signed for four men. A judge stayed one of the execution warrants, but the three remaining warrants could potentially result in the first execution in our state in 13 years. One of the cases in which appeals seem to be exhausted involves Terrance Williams. In October, Williams is scheduled to die by lethal injection for the murder of Amos Norwood in 1984, a crime committed when he was 18 and a college freshman. Williams is indisputably guilty of the crime. He’s also mentally competent. His defense attorneys argue that he was repeatedly sexually abused as a youth, including five years of abuse at the hands of the man he murdered, and that this helped motivate his violence. The state counters that all of Williams’ claims — including claims of sexual abuse — have had proper judicial review and been rejected. Terrance Williams deserves punishment. No one disputes that. But he doesn’t need to die to satisfy justice. We should think very carefully in the coming days about the kind of justice we want to witness to our young people. Most American Catholics, like many of their fellow citizens, support the death penalty. That doesn’t make it right. But it does ensure that the wrong-headed lesson of violence “fixing” the violent among us will be taught to another generation. As children of God, we’re better than this, and we need to start acting like it. We need to end the death penalty now. Pennsylvania Board of Pardons, 333 Market Street, 15th Floor, Harrisburg, PA 17126; phone: 717.787.2596. The Honorable Tom Corbett, Governor of Pennsylvania, The Capitol, Harrisburg, PA 17120; phone: 717.787.2500. This is a humorous exchange since the right wing nuts are being confronted by the Archbishop on a very important issue. The Archbishop recently remarked that the right wing Catholics are “nasty” and I can see why he drew that conclusion. Catholic teaching is Catholic teaching whether a right wing person is discussing abortion or the death penalty. It seems to me that the Church has decided to be more balanced in its approach to controversial issues and as Cardinal Dolan has stated it is true that the Church has alligned with the Republican Party too much (and perhaps this is a contributing factor in the demise of Mass attendance and the low level of priestly vocations). Seraph – But where and when did God give MAN the right (and capacity/ability) to decide when a fellow human person loses their operative dignity? In the “Moses example” that you referred to, it was God acting. “Both Scripture and Catholic tradition support the legitimacy of the death penalty under certain limited conditions. But the Church has repeatedly called us to a higher road over the past five decades.” I’m sorry, Your Grace, but to make such a statement, you must have been asleep for the past five decades, which have been marked by utter confusion and heterodoxy in Catholic teaching. Every time an American bishop puts forth the novel idea that the death penalty is immoral, he creates another excuse for American Catholics to vote for pro-abortion politicians. The death penalty is just punishment. It need not have anything to do with deterring crime or even with making society safer, though it does in fact do both. The death penalty is not revenge. It is the absence of just punishments that create a revengeful attitude in the populace. How is it possible for a Christian to support the death penalty? And how is it possible for a Christian to want to stop another Christian from stopping a killing? What part of the New Testament did I miss? I am stunned at the capacity of self-identified Christians to condone or even promote State-sancioned killing. Maybe Sharia law would be better. CCC – QUOIE ” 2267 Assuming that the guilty party’s identity and responsibility have been fully determined, the traditional teaching of the Church does not exclude recourse to the death penalty, if this is the only possible way of effectively defending human lives against the unjust aggressor. Today, in fact, as a consequence of the possibilities which the state has for effectively preventing crime, by rendering one who has committed an offense incapable of doing harm – without definitely taking away from him the possibility of redeeming himself – the cases in which the execution of the offender is an absolute necessity “are very rare, if not practically non-existent.” UNQUOTE. Vengence belongs to the Lord, but we are obligated to protect everyone from an unjust aggessor. This includes protecting prison guards and other prisoners. 2) all Catholics would be required to recuse themselves from Jury duty in potential death penalty cases, since the question is asked in jury selection. Is this what you want ? Abp. 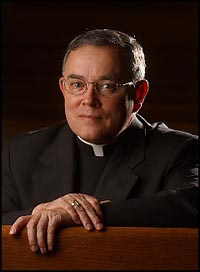 Chaput’s article demonstrates why bishops should not use their good offices to take sides on an issue, like the death penalty, where faithful orthodox Catholics can take divergent positions. What bishops like Abp. Chaput, as well most of his brother bishops in the USCCB do is allow themselves to be exploited by the anti-death penalty establishment. It is apparent to this observer that he is simply uncritically repeating without any qualification the erroneous and I would say fraudulent claims put forth by the anti death penalty lobby. Even more shocking is this claim “It does succeed though in answering violence with violence — a violence wrapped in the piety of state approval, which implicates all of us as citizens in the taking of more lives.” This at least give the impression of moral equivalence with the crimes committed by murderers. No matter where one stands on the death penalty, such claim is morally untenable. I for one am faithful Catholoic who supports the death penalty. not because I have a desire for revenge. I support it because I think it is still needed to protect the common good. I actually disdain teh fact that it is still needed. I wish we didn’t have to do this, but the overwhelming evidence suggests that we still do. I would say that on matters such as this, bishops, in their official capacity, need to restrict their statements to the domain of their competence. And that is stating the moral principles within which Catholics must form their views. This would enable them to effectively act as mediators, holding both sides accountable to those principles. But in the approach they presently take, they come off as more ideological than pastoral. And I also believe they make even more neccessary the very thing they are trying to abolish. With all due respect to the Archbishop, who I greatly admire, there are just some crimes that are just so heinous that true justice can only be achieved through the death penalty. Where does it say that it is undignified to be executed through lethal injection in a non-public atmosphere? Considering executions as “undignified” is a modern notion. If the Church wants to make an argument that death penalties are unChristian based on Christ’s “turn the other cheek” then I can see that as logical. Then no punishment could be applied, so the Church can’t make that argument. To say death penalties should be abolished because it takes away dignity from the criminal to me is fallacious. It has never been considered so until modern times. My goodness, Joan of Arc was burned at the stake for supposed heresy.